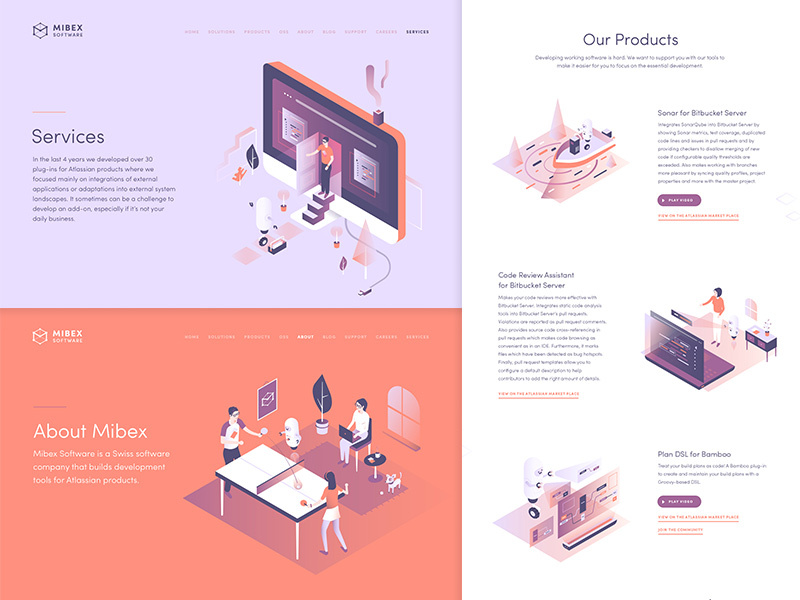 I worked with Zurich based software development agency Mibex, on new branding, marketing website design and illustration. 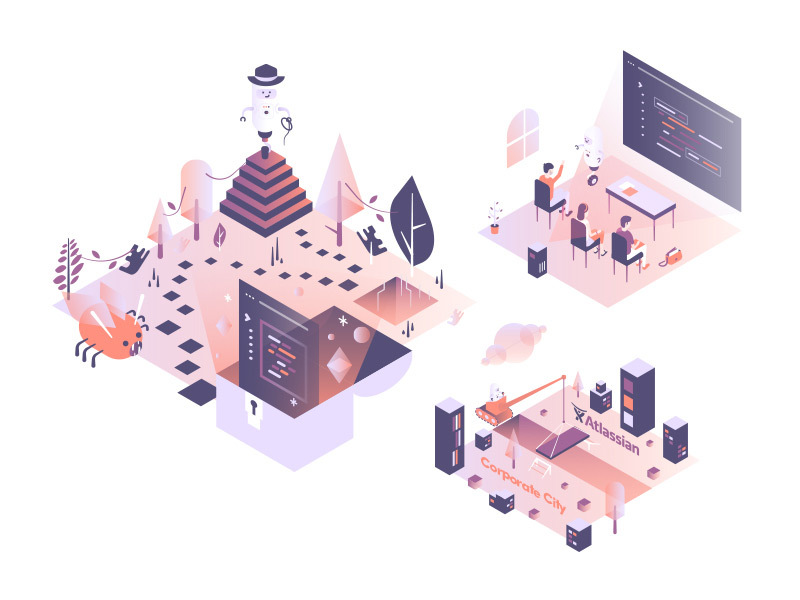 Mibex build development tools for Atlassian products, with the aim of improving workflows, helping to cut time-consuming corners and generally aid developers to work more efficiently. Mibex wanted me to create a technical and reliable overall look and feel, but also include an element of fun and friendliness. We started by discussing what their main goal and objective is as a company, it quickly became obvious that at their core, Mibex create software to help developers. To be at the developers side while they work, making difficult tasks simple, quick and generally improving workflow. As I've said before, I love projects where illustration can take centre stage. For me, the thing that can make a brand stand out most, even more so than the company logo, colour scheme, or typography choices (which are all important too, of course) are the visual assets used on the companies website. And, in this case Mibex were very keen to use illustration to explain and visualise what they do in a 'high-level' way. As an overall theme, we decided to go with the visual metaphor of a 'helper robot', to literally be at the side of the developer, improving their work. 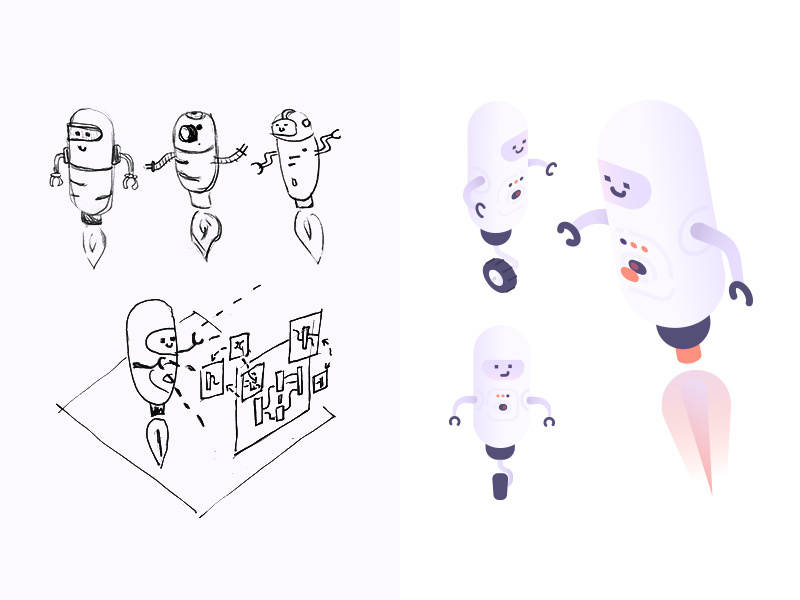 I started with rough initial sketches of how the robot could look, simple and friendly, hovering or rolling around the illustrations. The robot appears alongside developers in various situations, helping out with planning, reviewing and automating code. Mibex build add-ons for Atlassian products like BitBucket and Bamboo, Sonar for Bitbucket Server and Plan DSL for Bamboo. Illustrating some of these add-ons called for the robot to be on a speed boat using sonar to find code, automating inside a computer, 'tailoring' repository templates and even navigating a 'jungle of code' Indiana Jones style! 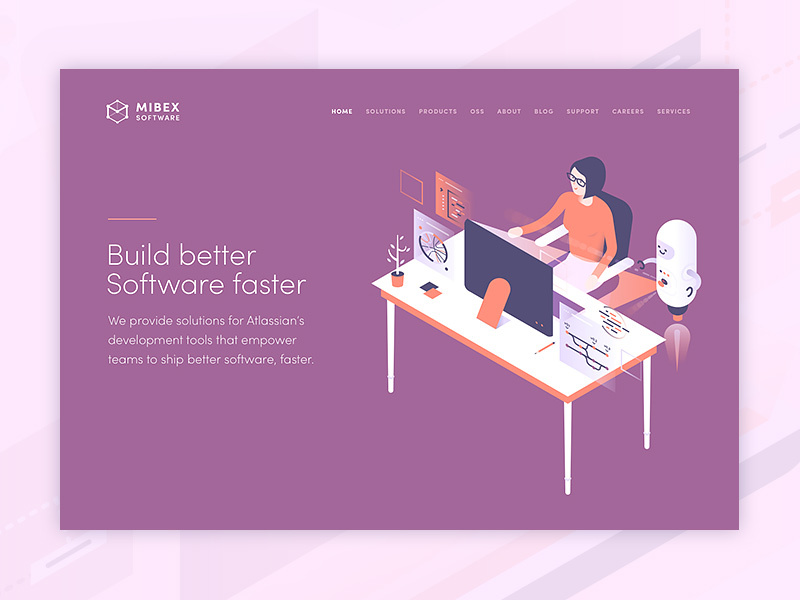 The website needed to be a relatively simple set of marketing pages to explain Mibex's software solutions and services at a high-level, while linking off to their various add-ons on the Atlassian marketplace and the usual contact, careers information and blog. I used different tones of the main branding colours of purple and orangery-red through the site, mixed with large areas of white space to hopefully create an easy to use, balanced and informative experience. Every project is different, but in this case I worked on the logo after the bulk of the illustration and web design work was in place. Sometimes I find that working in this way allows the company look and feel to evolve without being constrained by a pre-existing logo, set of colours or typography, that might not be based on the experience of working with companies actual 'content'. The logo can then be created with guidance from a body of work in place that is based concisely on what the company does and it's messaging. That said, I then had the task of creating a logo to fit in with the look and feel of the site and illustrations. In this case Mibex wanted a simple 'M' mark, combined with 'nodes', associated with code repositories that their developer base use and understand. Style-wise the 3d effect cube reflects the look and feel of the isometric illustrations. We then extended the branding to work across t-shirts, business cards, posters and an A5 brochure. 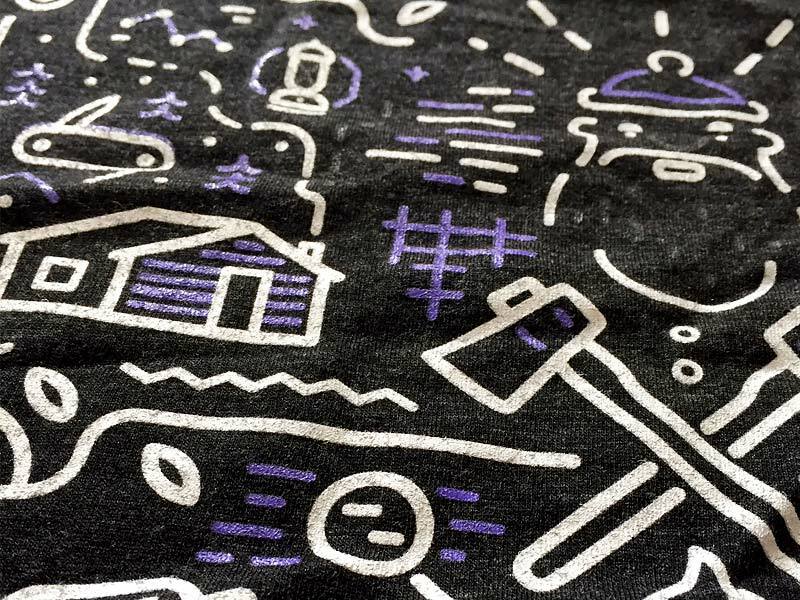 The final outcome is a project that genuinely is one of my favourite ever to have worked on. You can see a few more screens from this work in my main portfolio, if you have project that you think I could help with, please get in touch. 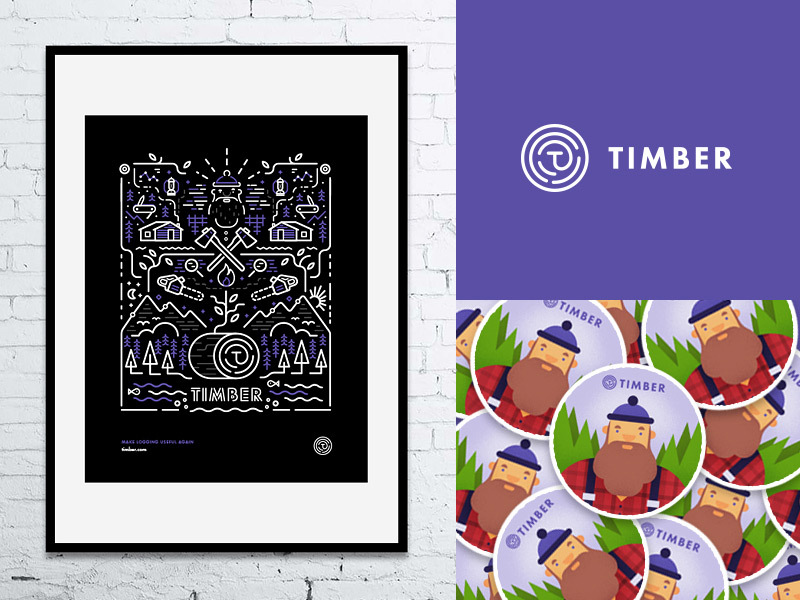 I worked with New York based startup Timber.io, on new branding, marketing website, illustration and animation. Timber make the traditionally difficult task of monitoring data logs easy, with their new interface that streamlines and modernises the whole process. 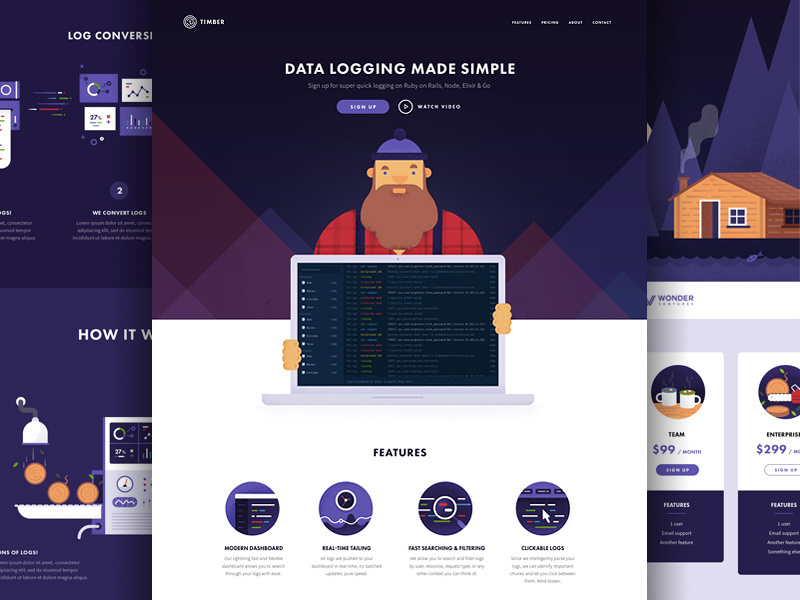 Logs flood into the UI and unlike anything else currently on the market, Timber allows users to easily search, filter, spot trends and even click on individual logs to gain insight in a way that until now, wasn't possible with traditional data logging. 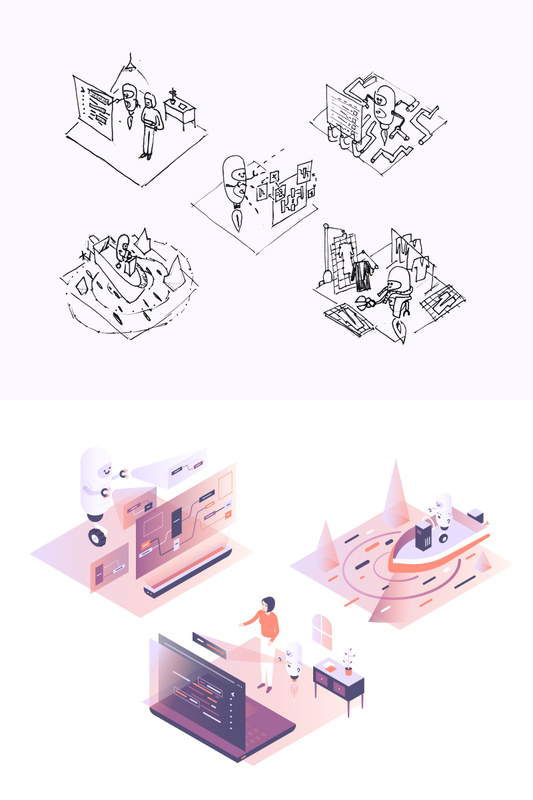 Timber wanted me to create a visual style for the company that injects a bit of fun into what could otherwise be a relatively dry subject matter, something that appeals to developers (the main users of a product like this) but also would be memorable to any casual viewer. The process started with discussion around the overall visual route to take, during these early stages the final company name wasn't yet 100% settled upon, so we decided to explore two main routes. The first being around the name Timber, running with the visual metaphor of logs, trees and all things Lumberjack related. 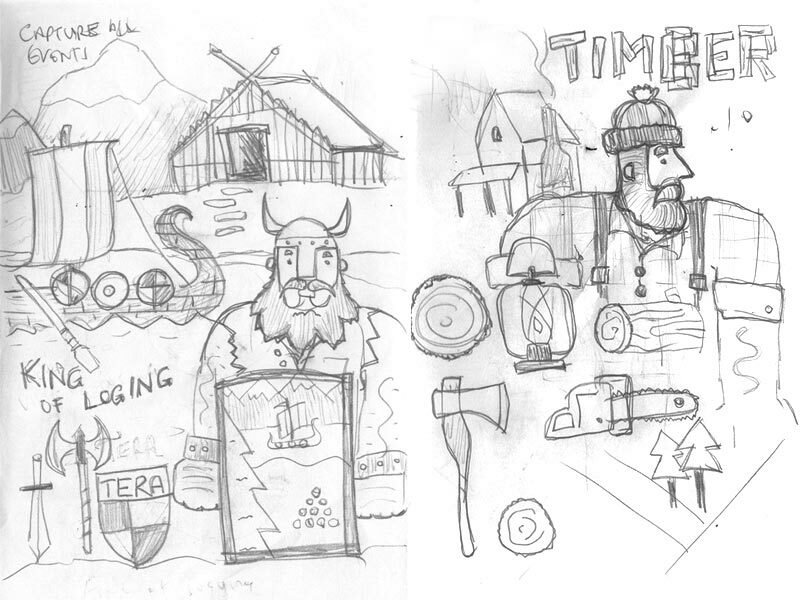 The second route was to go with a Viking theme, again hinting at the connection between the use of logs, perhaps to make boats and houses, but with the main difference being the use of a Viking mascot. I started out by simply sketching some really rough ideas to help us envisage what both routes might look like and then fleshed these out into full visuals. At this point it became clear that the Lumberjack route resonated more with people we had shown the work to. It's just more of a direct connection, the almost pun-like quality of linking data logs, with wooden logs just works. It was less of a stretch for viewers of the site. For the Timber logo I created something simple that hints at the idea of data as well as the visual metaphor around the name itself. This ended up being the letter T in the centre of a log, the lines around it creating tree rings, but also the general idea of 'strings of data'. This then led onto a poster and t-shirt design, that supports the overall brand. It's a slightly different style to the main website graphics, but feels like it's part of the same family. Hopefully, everything comes together to create a look and feel for the company that is modern and trustworthy, but with a hint of fun that makes it memorable. To get across some of the high-level ideas behind what Timber does, I created some simple animation to be used in various places on the website, but mainly via a 'how it works' type of graphic. Again running with the trees / logging visual metaphor, I came up with the idea of combining 'real life' logs with data logs, in a kind of logging conveyor-belt machine. 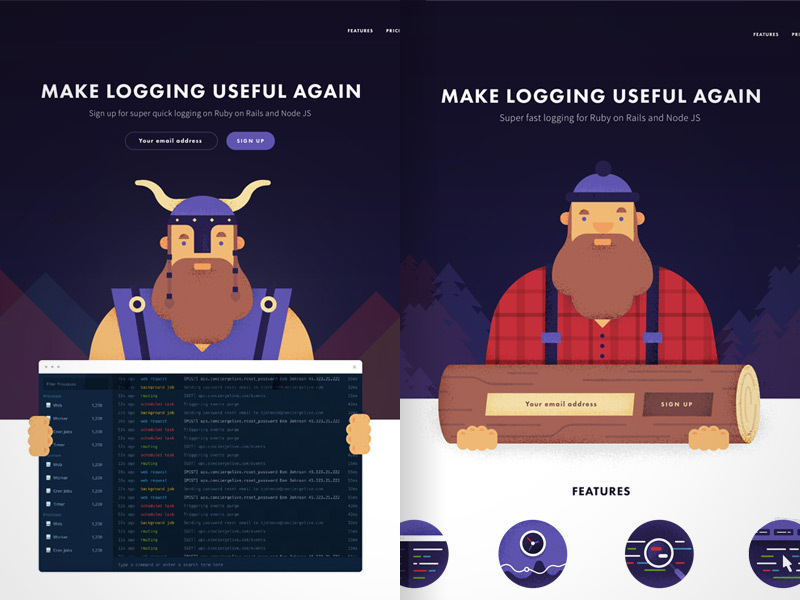 This continually looping gif communicates the idea that a never-ending number of logs are fed in, the hard work is done by the Timber machine in the middle, and the end result is a clean and clear user interface at the end. I also created a simple looping gif for a 'coming soon' holding page. And a bit of fun for the 404 page, where our Lumberjack mascot find himself (like the user) in the wrong place. The final outcome of this project is a set of work that I am very proud of. I'm extremely grateful to the team at Timber for allowing me to run with my ideas. In doing so have hopefully come up with something memorable that is a little different from the norm. You can see a few more screens from this work in my main portfolio, if you have project that you think I could help with, please get in touch.